German gold coins are one of the most coveted coins among collectors; and no numismatic collection would be complete without these rare pieces. German 20 frank gold coins represent a very important historical period in the foundation of unified German Empire. Otto von Bismarck, the Chancellor of Germany at the time, was responsible for creation of centralized banking system among previously separate German territories, which played a very significant role in minting of the first batch of German gold coins in denominations of 20, 10 and 5 marks starting in 1871. Before that German coins had been minted in wide varieties and denominations by mints in different German States without any centralized system. Today coins minted before 1871 could be found under names like krone, thaler and ducat. Despite newly centralized banking system in 1871, German states were still legally entitled to mint their own smaller denomination strikes, however, the most renowned and well-known state to produce gold 20 frank was Prussia. The very first group of 20 frank German gold coins proudly wore the profile of Wilhelm I, the King of Prussia. King Wilhelm II image was struck on the face of a 20 frank coin minted in 1913. 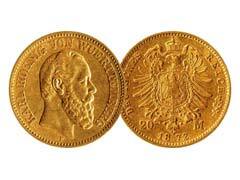 The overall mintage of 20 frank German gold coins was stopped in the year of 1915, right after the beginning of WWI. No gold coins were ever minted following this year, not even during the Third Reich rule which ended in 1945. Wilhelm coins weigh a quarter of an ounce with .2304 troy ounce of pure gold content and are very often compared in collector popularity to British sovereign gold coins. However, the scarcity of German coinage caused by devastating effects of WWI places them much higher on the rarity list compared to even much coveted French gold coins. Along with historical German gold coins, modern day Austrian gold Vienna Philharmonics coins which were first minted in 1989, take a very important place among major gold bullion coins intended to create a recession proof investment portfolio and a fantastic addition to any numismatic collection. Vienna Philharmonics coins are minted from pure 24-karat gold and are proudly embellished with musical instruments from the world’s famous Philharmonics Orchestra. They come in four various sizes ranging from one tenth of an ounce to a full ounce. These were minted with the intention for bullion investment, however their aesthetic appeal landed them in many numismatic collections all over the world. Vienna Philharmonics were one of the best selling bullion products in the world for several years in the 1990’s.